Sidewalks and driveways are the bread-and-butter projects for a mason service, and at AAP Construction we are no different in this aspect. Where we are different is that we approach something as regulation as sidewalks and driveways with the same diligence and care as we would approach a stonework or fireplace project. It is because we approach even sidewalk repairs with diligence and care that we have burnished our good name since 1993. Just as the proof of the pudding's in the eating, the proof of a sidewalk is in the walking. An uneven sidewalk just feels unpleasant to walk on. You can be sure that AAP Construction will give you a level sidewalk that will stay level. How do we do it, though? Well, first a sub-base of gravel or limestone has to be installed. Second, the channel has to be bedded, leveled, and compacted. Then, after the slabs are laid, adjacent slabs must be adhered with jointing material. Having been making sidewalks from 1993 until now, we have gained so much experience in these steps that we know them by heart. 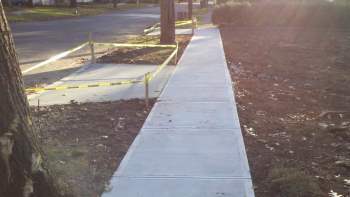 AAP Construction will do a thorough job with your sidewalks. Neither you nor your visitors will trip over a protruding slab or feel uncomfortable on an uneven surface! What is more, we will do the work – be it building, maintenance, or repair – at the same kinds of fair and affordable prices that we have been invoicing since 1993. Why not give us a phone-call at (973) 298-1013 today? Go ahead, call us, no matter what your sidewalk needs. A friendly professional will be pleased to provide you with fair quotes but without any sales pressure!